In 1976, four jet engines that were responsible for powering all com­mercial aviation in the United States. These engines consumed 10-billion gallons of fuel per year.-4 The ECI project focused specifically on devel­oping fuel-saving techniques for the JT9D, JT8D, and CF6 engines. It ignored the JT3D. the fourth major engine, because most industry ana­lysts believed it would not be produced in the future. Introduced in 1964, the Pratt & Whitney JT8D engine was a “phenomenal success” and at its height of popularity flew 12.000 aircraft of different types.25 Two years later, Pratt & Whitney introduced the JT9D engine, often referred to as opening a “new era in commercial aviation ” because it was the first high-bypass engine to power a wide-body aircraft. 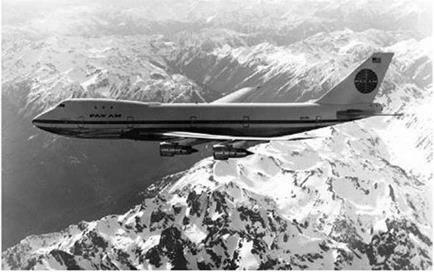 It was first installed on the Boeing 747 Jumbo Jet. and Pan American placed the first order for this new jet in April 1966.26 The CF6, a General Electric engine first introduced in 1971, was used on the DC-10 and became the cornerstone of its wide-body engine business for more than 30 years. There were two main thrusts to EC1 —Performance Improvement and Engine Diagnostics. The Performance Improvement section began with a feasibility study to examine a variety of concepts and to prove which one might offer the highest fuel-savings results for the airlines industry. The study looked at the development of an analytical procedure to deter­mine possible concepts, the identification and categorization of concepts, preliminary concept screening, and detailed concept screening. 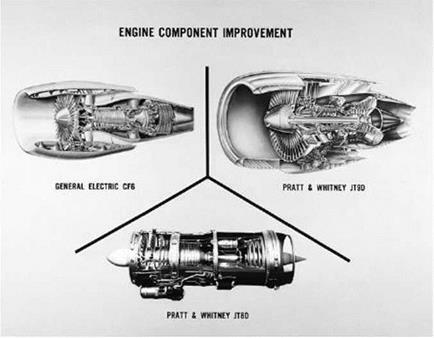 Engineers evaluated 95 concepts for the Pratt & Whitney engines and another 58 concepts for the General Electric engine. The job of the airline industry was to "assess the desirability and practicality of each concept. "3′ The con­cepts were evaluated on two main criteria—technical and economic fac­tors. Technical factors included performance, weight, maintenance, fuel – savings potential, material compatibility, development time, and technical risk, while economic factors included fuel prices, engine cost, production levels, operating costs, return on investment, and life expectancy. Using these criteria, the 153 initial concepts were quickly reduced to 18 and 29, respectively. They were then reviewed in greater detail by NASA and the airlines, which identified 16 concepts that could meet their goals. The content of these projects can be broken into several important areas. The first was leak reduction. An aircraft engine is similar to an air pump in that it moves air from in front of it to the back. By adding energy to it, the speed of the air moving through the exhaust is faster than what originally came through the inlet. Any air leak in this system caused it to be inefficient, just like an air pump leak. ECI engineers looked for areas in which engine seals could be improved to reduce this leakage. A second major area for improvement was in aerodynamics: ECI engineers devel­oped improved designs of the compressor and turbines. A third area was ceramic coatings on components, which was important because it reduced the necessity of cooling holes and both increased efficiency and reduced manufacturing costs. One known problem with these or any type of engines wfas that over time, various components begin to deteriorate because of operational stresses, which included combustors that w’arped because of continual fluctuation in temperatures from hot to cold, compressor blades whose tips w’ore down over time, seals that began to leak hot gases, and turbine blades eroding from high temperatures. Other types of damage could occur when foreign objects such as stones or dust entered the engines on the runway and caused dents, breaks, or scratches to the fan blades. The engines were durable and could typically tty for 10.000 hours before they needed major maintenance, but during that time, the engine slowly became less and less fuel efficient because of small degradations that did not compromise the safety of the aircraft. Furthermore, the major maintenance sessions never restored the engines to their original levels of fuel efficiency. Pan American engineers said that prior to the ECI Engine Diagnostics program, “engine deterioration had been largely a matter of educated guessing, speculation, and hand-waving.”” This deterioration became the focus of the Engine Diagnostics program, and engineers estimated that by preventing these wear-and-tear issues, aircraft would become more fuel efficient. Third, the ECI program helped to maintain the competitive advan­tage of the entire commercial aircraft industry. For example, in February 1980, Boeing executives approached NASA to ask if they could disclose results of the ECI program to foreign airlines, because in order to sell new American aircraft in the international marketplace, the company needed to show its more advanced understanding of engine deterioration and how to improve engine performance. NASA agreed with Boeing’s request and stated. “In order to meet the challenge presented by interna­tional competition, it is appropriate that the U. S. aircraft industry use the technology generated in the ECI program to maintain its dominant posi­tion in the marketplace.”4*As Roger Bilstein wrote, “Research results were so positive and so rapidly adaptable that new airliners in the early 1980s like the Boeing 767 and McDonnell Douglas MD-80 series used engines that incorporated many such innovations.”   Though the fuel-efficiency rewards were never intended to be as high as in other ACEE programs (including the Energy Efficient Engine), ECI was successful in achieving a significant fuel reduction of roughly 5 percent, exactly what its engineers projected at the onset of the program.